Fig. 2. MSC Activation. After there is tissue damage, different proinflammatory cytokines produced by lymphocytes can “activate” MSC to start producing anti-inflammatory factors like indoleamine 2,3-dioxygenase, prostaglandin E2, nitric oxide, interleukin 10. Pathogen-associated molecular patterns (PAMPS) and Damage-associated molecular patterns (DAMPS) can also activate MSC by ligating with toll-like-receptors on the surface of MSC. 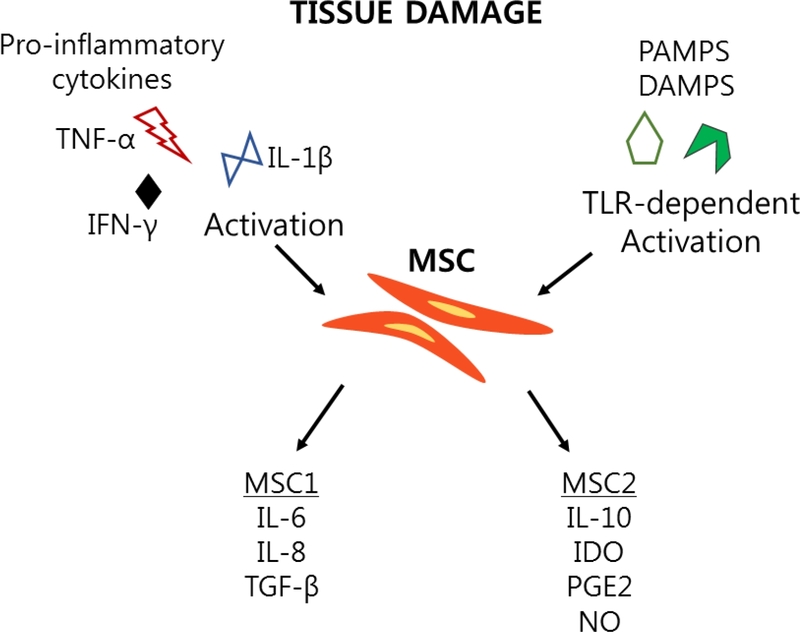 Depending on species, different TLR ligation can commit MSC to express either a pro-inflammatory phenotype (MSC1) which secretes proinflammatory cytokines like interleukin 6, interleukin-8, transforming growth factor beta, or an anti-inflammatory phenotype (MSC2).